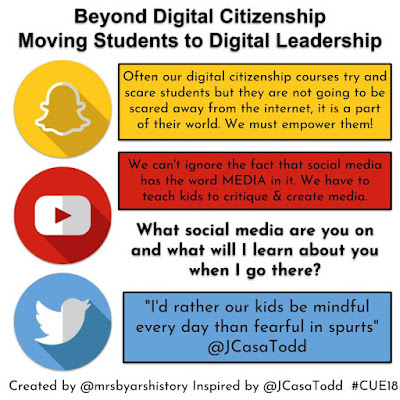 I was so lucky to attend a breakout by Jennifer Casa-Todd about Digital Leadership instead of Digital Citizenship. She is the author of the book SocialLEADia and an advocate for empowering students to use social media to share their voices with the world. It was the kind of session that made me feel like I had to do something right away because if I didn't, I was failing my students. Social Media allows students to experience all aspects of digital citizenship and 21st-Century skills. If we as teachers are supposed to develop these skills, why are we not using social media in class? 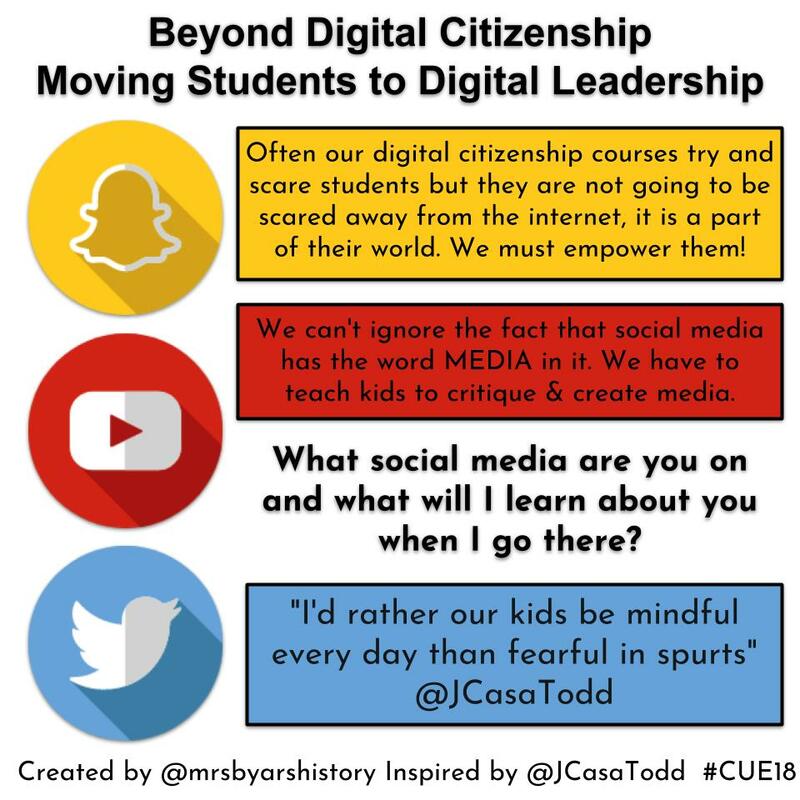 No longer can we stand behind a lecture on digital citizenship or a video, students need to go out there and try things in an environment where they will be supported. Let students be online in a way where we raise them up and celebrate their success and help them learn and grow from their mistakes. We can't do these things if we lock them out of the internet. We can't do these things by just trying to scare them away from something most of them have known and used their whole lives. So I came home and immediately got to work. I had an old twitter handle for my classroom that I had never really figured out how to make work and I decided I wanted students to run it. I also had an iPad mini that was donated to me that I could easily put in the hands of students and log onto Twitter. I picked a few students to try it out and let them know the night before but then life struck and I suddenly had a fever of 102. I was stuck at home in bed but I didn't want that to stop me from trying this, besides - I still had total control of the account from home and could monitor how my students were doing. So with some tech support from one of my amazing colleagues, Mrs. Copete, my students signed on and shared their experience in my class with the world. Doing an awesome bellringer right now!!! Sending me an email to the fam!!!! These are just a few of the many tweets my students sent from class. They are talking about what they are learning, lifting each other up, and sharing their own opinions of class. Students were communicating and collaborating. They were thinking about the digital footprint they were leaving because they knew it not only reflected them but me and all of their classmates as well. I am so grateful to have been inspired by the #socialLEADia movement and the work of @JCasaTodd. I can't wait to see what my students tweet next. Do you have a class twitter account? Share it in the comments!